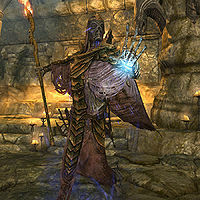 Vokun is a high-ranked dragon priest found in High Gate Ruins, east of Solitude and northeast of Ustengrav. As soon as you attempt to proceed past his sarcophagus, he erupts from within and proceeds to attack. As with all dragon priests, he is a formidable undead foe. Vokun drops a powerful, enchanted heavy-type eponymous mask. It grants a 20% reduction in casting cost for all spells from the Conjuration, Illusion and Alteration schools. Vokun is the guardian of the scroll you must retrieve for Anska in the related quest, as the scroll lies in the chamber behind his crypt. He carries a Staff of Fireballs, dealing a powerful 40 points of fire damage in a large blast radius. Vokun has the ability to summon a storm atronach at high health. "Vokun" means "shadow" in the dragon language. In the Creation Kit, Vokun is called "Ianusu". This page was last modified on 2 August 2015, at 19:55.